You should head on over to WeddingSparrow.com to have a look at the beautiful photos taken in Vantage, Washington. The setting was stunning and the details were amazing. You will wish it was the setting for your event. We were honored to be a small part of the day and are delighted with how it turned out. Lots of talent and hard work went into making this happen. Earth Silk Sample Cards – At long last; longer lengths! Since we started our silk dying studio in 2010, we have known there was a need for this, now we have finally made it happen. The Earth Silk Sample Set gives you a look at our 90 blends in a new way. The 1 inch wide lengths will let you see how the dyes interact with the material in a more informative way than our 5/8″ swatches can. The eight yard lengths allow you to see how the patterns that form on some of our blends, repeat. Unlike the swatch card where the silk is grouped in numerical order, on the silk sample cards we have arranged them by color. You can find these sets on our samples page here custompaper.com/samplesets. We have numbered them on both sides, with the silk overlapping by a half inch. You will notice that the ribbon’s number is centered on the correct color. You can also use the web site as a quick reference if you are unsure. We were thrilled to receive news of our inclusion in the latest book by the talented Elaine Schmidt: How to Make 100 Ribbon Embellishments: Trims, rosettes, sculptures, and baubles for fashion, decor, and crafts. This is the second time Elaine has used our products, the first was in her second book The Complete Photo Guide To Ribbon Crafts. The tutorial using our silk ribbon is featured below. This is actually not our first foray into the publishing world. Our products have also been included in Green Wedding, It’s Easy Being Green and The Everything Green Wedding Book. Thank you, Elaine – and congrats on yet another lovely publication! Well we did it! We battled Super Bowl hotel prices, a slushy snow storm that shut down parts of the city and empty propane tanks (burrrrr!) in our efforts to put our Earth Silk ribbon line in front of an East Coast audience. We know we are biased, but we are consistently amazed by the projects our clients create. Luckily, many of them are eager and excited to share said creations and generously send photos our way upon completing a project. Jewelry designer Amanda Ace creates one-of-a-kind pieces and delivers them to clients in beautiful packaging (if we do say so ourselves) featuring our handmade papers and ribbon. It is an enormous compliment to know your designs are being chosen for a first impression. We recently worked with another client who created this gorgeous bridal bouquet using our silk ribbon, shown here in her wedding day portrait. Any of you brides and creative folk reading this; be sure to share your work with us so we can feature it here. Here is a quick look at the Northlake Wedding Program for the Center for Urban Horticulture event space. We are using our Earth Silk ribbon blend #016 in conjunction with the lotka seed paper, black print and a light weight slate background. We think this says Whimsical Romance! What do you think? It appears we have officially segued into the fashion industry: we have launched our very first silk ribbon wrap design! This is a one yard length of our hand dyed silk that is finished with two pointed ends and a seam stitch along the entire length. Our modern take on the classic “fairy ribbon” design is available in over 150 color options. These Earth Silk ribbons are made by hand in our Seattle studio. We measure, mix, dye, rinse, wash, dry, fold, iron, stitch and sew to bring you this great wrist accessory. The wrap is a thoughtful, eco-gift idea and an easy and affordable accessory option to elevate any ensemble. After years of inquiries, we are excited to offer to offer a hand dyed silk ribbon option to our jewelry-designing and accessorizing clients worldwide! We just shipped this custom ribbon to a happy bride. She wanted to order our pressed hydrangea flowers but she needed a silk ribbon to match the hue of the flowers. We have over 150 colors in our hand dyed silk ribbon line but none that were quite the right shade, until now! We offer custom dyed silk ribbon with a low three spool minimum purchase. Once we have your color matched, chances are it will become part of our growing line of silks. For those customers looking for an exclusive ribbon for product packaging or a signature line we can offer you a five year license of your custom color if you pay a $400 development and licensing fee. We will keep your design out of our product line while it is under license. It is always a pleasant surprise when we stumble upon our products or work in the blogosphere. Last week we had a client mention in passing that they had included photos of our seeded paper used on a wedding project in a past blog post. Stacey and Company is an invite, décor and event planning company in California. We have been working with Stacey since 2007. 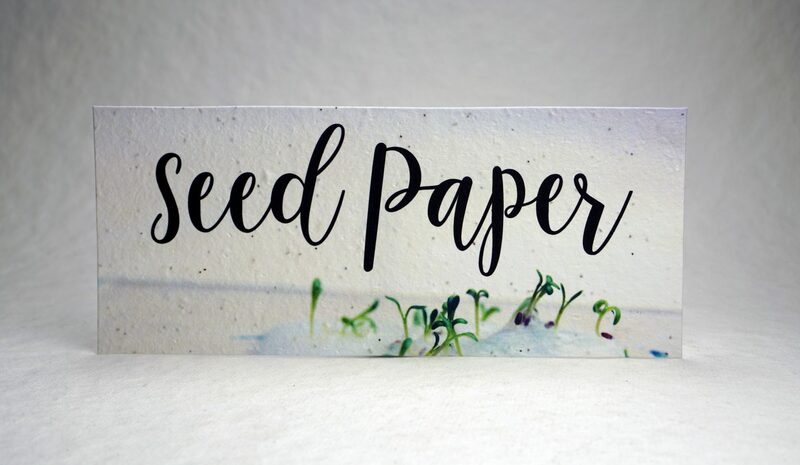 She often uses our seeded papers when working with clients who want stylish, green paper options for their events. We love how this couple used our seeded products throughout the event and also as their take-home gift for their guests. You can check out the entire post here. The Green Bride Guide is a go-to resource for those searching for “wedding ideas, inspiration and supplies to assist you with planning a green wedding.” They included our hand dyed silk ribbon as a way to add “glam” to your eco-wedding, and offered some great suggestions for integrating our ribbon into wedding décor. “Speaking of eco-friendly ribbon, there are about a hundred ways to use the stuff in your decorations—from creating sparkling gold garlands to wrapping it around your bouquet. Tie shimmering tendrils to your up-do, or weave some thin strands into the bodice of your dress. Decorate your chairs and tables with ribbon and use it to add some metallic accents to your ring pillow or flower girl basket. The possibilities are endless.” One of our favorite uses so far has been a wedding background trellis covered by streamers of silk that gently move in the slightest breeze, we are still trying to get Pearl and Godiva to share their images with us (nudge nudge). You can check out the Green Bride Guide post in it’s entirety here. Thank you Stacey and Company and Green Bride Guide for supporting our work!